Wowee, what a week! 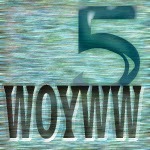 I'm still visiting WOYWWers, and still infused with the goodwill of the swap; how good it feels - thank you. I was going to show this anyway, but look - such an appropriate text! 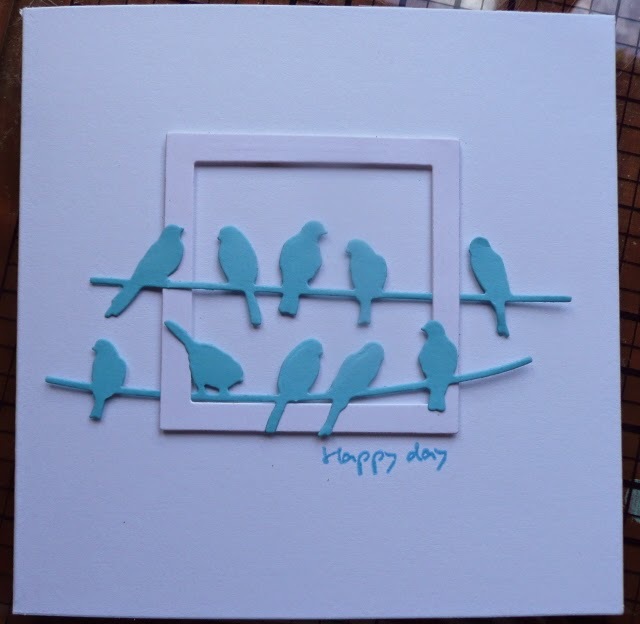 The birds die is by Spellbinders, from the 'diesire' range. I also want to tell you that thanks to those who came to the Crop last weekend, I've sent a cheque to The Alzheimer's Society for £150.48. That's a lot of money. As the ticket seller, I know how generous each of you were in your contributions, please be proud of yourselves. Thank You. 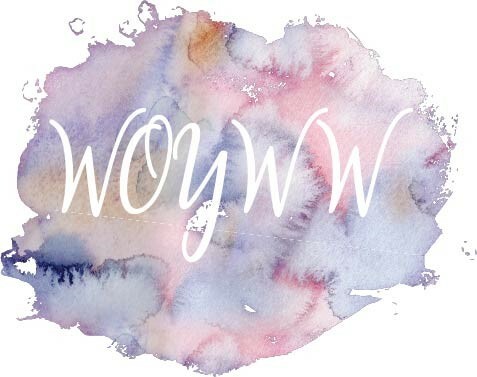 I've received heaps of ATCs and good wishes as a result of the 260th WOYWW and I will eventually communicate more effectively than by blog, but meanwhile, thank you. Yes Deskers and Readers, today is the 260th Wednesday that we've linked in one way or another to each other. That's FIVE, 5, count them 1 2 3 4 5 years. How utterly amazing you all are. At WOYWW, We all know each other. Sure, we have some sort of craft and creative expression in common, that's just a good start. My beautiful daughter is an only child and we're very aware of it. We've taught her to presume that on the whole, other people will want to get to know her and be friends; that she never needs to be 'lonely only' that her father and I are often reminded that she could be. 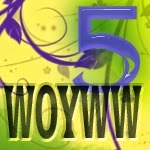 That's the spirit of WOYWW - a presumption of Friendship. It was really evident last Saturday at the Crop; I hope that even though some people walked through the door alone, they did not walk through the door with trepidation at not knowing a soul. That thing about 'meeting strangers off the internet' just doesn't apply here. I'm confident that if you find yourself in the home town of any Desker, any where in the world, with a bit of contact and some notice, you could share a coffee and a chat without difficulty. After all, we bare our workdesks to each other and that's the sort of thing only friends can do! Please go on joining in. Remember, it's not a members only thing, and you just dip in and out when you can or when you like. Reciprocate the visits and make some friends why don't you. 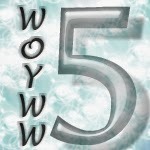 The major 'rules' are about blatant advertising because WOYWW is not about that...and I will let you know if you get too obvious! 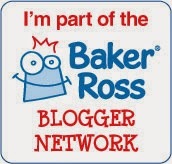 These lovely badges are for you to lift and plonk on your blogs if you want to; an anniversary gift to you from Nikki C..honestly, this blog would be nothing without all the talent out there! So now - if you have an ATC to trade, please include the * after your name when you type in the Linky details. The next name below yours on the list displaying an asterisk * will be your recipient..make contact for an address. Easier than it sounds. And don't worry - if you forget the asterisk * - re-link, I'll be on hand today to delete any double links. It'll play havoc with the numbers, but we're all grown up and can cope with that. I guarantee that you'll still be living and breathing, and that's the real priority, huh! If you are the first on the list, fret not, the last name* on the list will be your sendee. A perfect circle of friendship. Like the expression or not, that's what it is! As photos seem to be the thing for this WOYWW week, I thought it an appropriate time to tell you about the offer I got from Mr Nutcase. Really. They make phone covers. And they make 'em fast! Mine came the next day; lets be honest, that's just the sort of on-line ordering we like! You need to ignore the little black line at the bottom...that's possibly the bit where I thought I would add some text, decided not to and might have forgotten to remove it. Ahem. But never mind that. Lookit! 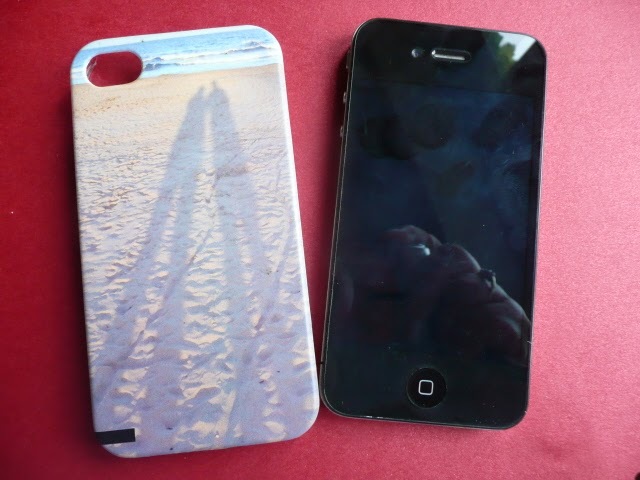 I have a fab 'phone case for a rapid and satisfying, present affordable £14.99. And of course, my old shape iPhone isn't the only style for which they'll print your cover, oh no..masses of choices. None of my male family read this, so there will be a few ordered for Christmas I don't mind letting on! I mentioned in the early 'showing off' phase of my new case that it didn't feel like the sort of plastic I was expecting it too. Miss Dunnit took it from me and advised me that it was the anti-scratch surface that felt unfamiliar. Blimey, colour me impressed at my case and her knowledge! Now, for some sharing. 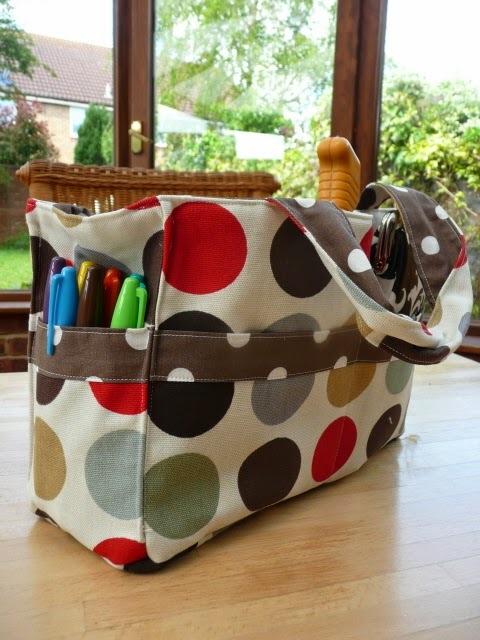 The company, Mr Nutcase, is offering you, gentle reader, a 10% discount off your bespoke order too... you just include the coupon code Thanku10 when you checkout. I haven't met him, but when I do, I shall shake the hand of this particular Nutcase! Did I mention there was a WOYWW Crop? It's been and gone. A lot of people made huge efforts to get to it. I didn't. A lot of people brought loads of stuff to show and tell and share. I didn't. Jan made a marvellous lunch and worked very hard. Yep, you guessed...I 'helped'. A lot - A LOT of people took A LOT of photos. I didn't. I stood on a chair so that I could enjoy an audience...the barrage of cameras turned me into a diva! And this sums up the day....here's Jan, laughing. There was a lot of that. 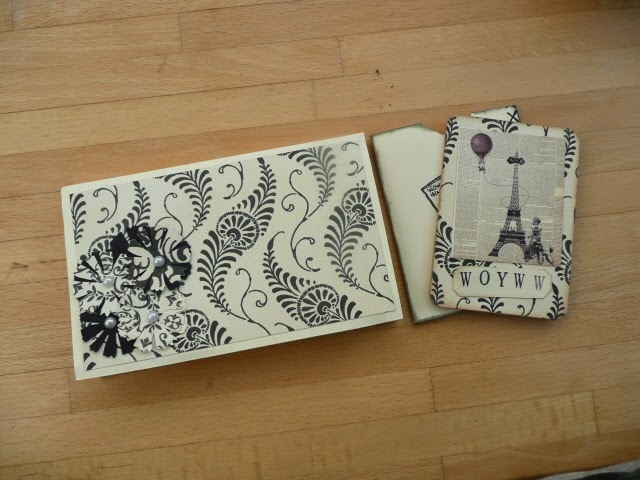 I lifted these photos in an outrageous steal from Helen's blog....she takes a good 'un! If you came to the Crop - thank you, it was lovely to see you and despite not having enough time, I think we at least had a 'hello' and a decent 'goodbye' chat? If you are a Desker and didn't manage to come, you were with us, we all talked about each other and the friends we've made. There will be greater photos and in depth analysis on other's blogs, and I hope you'll get the vibe that I did. Warm. Friendly. Utterly WOYWW-y. This is not the normal tale that you expect from me the day before a Crop. No Sir. Normally I'm whining about lack of light, time, choice..something. All for a day of cropping. But tomorrow is different, because it's the WOYWW Crop. Which means that I'm not taking anything to do. Secure in the knowledge that if I even think about doing anything, I shall disappoint myself, by not even unpacking it. For me, tomorrow is one long visit! real, in the flesh Deskers to chat to and make tea for. So here's a finished LO a decoy for sure! A marvellous day off, for me. Not so for Jan, who says she enjoys her role....she cooks and prepares all day today and then takes charge in the kitchen tomorrow. After she's organised the room. Because she's like that. Really, I just turn up and chat. Marvellous! We'll be talking about all the Deskers, and as usual, probably by blog name for ease of understanding - it's a whole other language! So don't feel you're missing out really, you'll probably have to read a bit about it....! 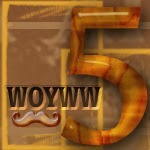 Well Deskers, it's only a week till our fifth anniversary. 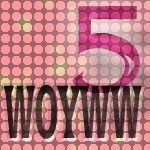 You can read all about the WOYWW what HERE and all about our anniversary ATC swap intentions HERE. Come on and join in, there's no qualifying period, just play the game! 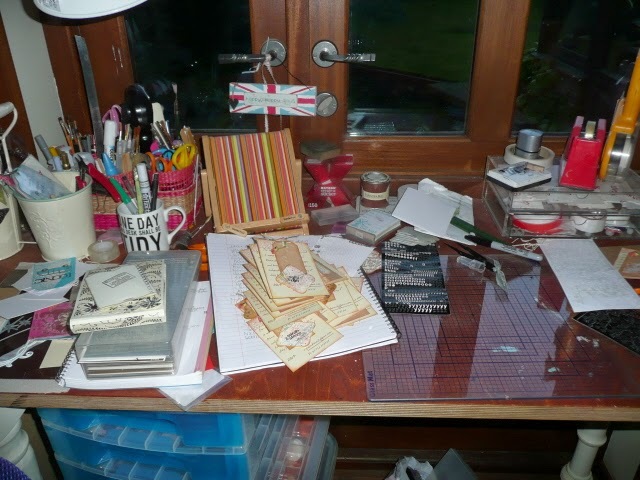 Meanwhile, here's the desk..it's had a bit of action, at last and will be cleared and tidy. Ummm..any day now. Taken at about 5.15pm on Tuesday evening, so despite the cloudy grey day interspersed with torrential showers, it's looking pretty good for natural light! I'm working on a bunch of cards for a workshop on another theme - 'Doilies' this time. I'm slow..but really quite enjoyed the hour I've managed so far. Just as well, I want to deliver them before Shopkeeper Gal starts her workshop on Thursday morning. We'll see. It's the WOYWW Crop this saturday. If you have a last minute change and would like to join us, just let me know! Please though...I'm more than a bit busy right now, so give me a day to respond..I'm not getting to the old computer much! 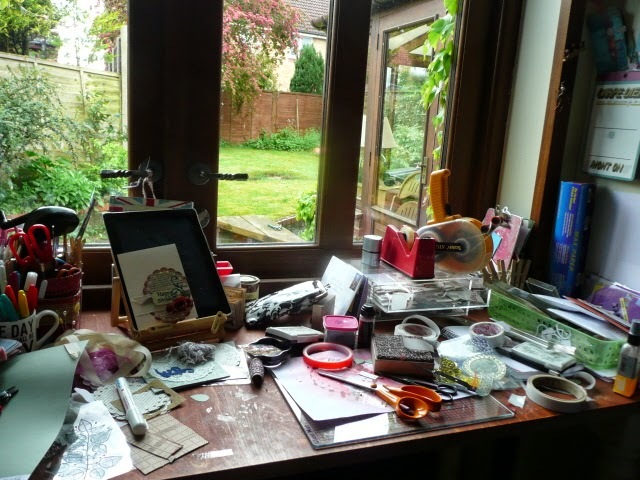 Meanwhile, jin in with us will ya - show s your workdesk/space and what creativity lies upon it. We'd like that very much. Thanks! Really? I Did that? How embarrasing. Yesterday was workshop day at Kraft Crazy. Which means I turn up loaded with card kits, materials and enthusiasm to conduct a workshop - this summer, I've tried to theme them. Because I've been rather stupidly busy and had my head elsewhere, yesterday I had to get up super early to finish the kitting preparation. 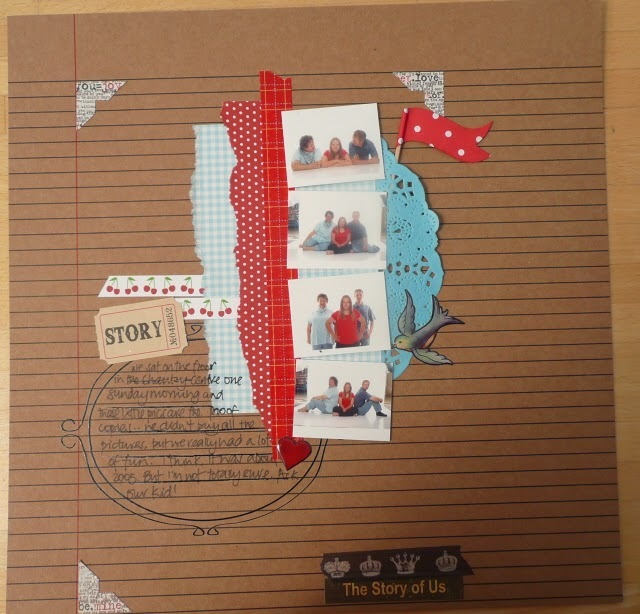 The workshop had a lot of die cutting involved and I hate it when people have to wait or share, it holds everyone up. You know. 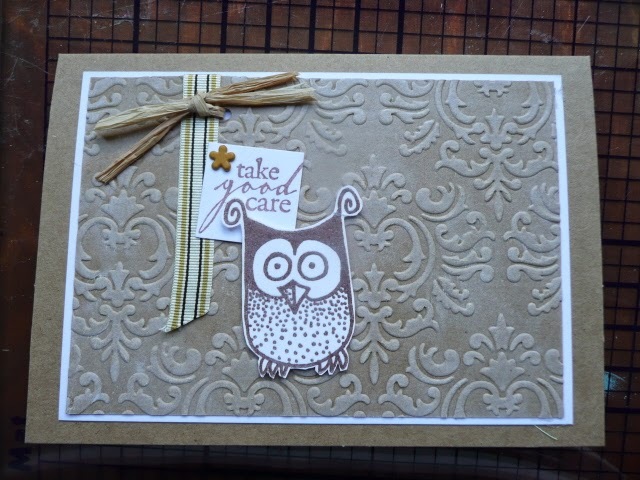 The not so wise Owl...Magenta, Hero Arts and a Cuttlebug folder. Generally, I turn up and the samples that I've pre-delivered to the Shopkeeper Gal are ready for me to match up with appropriate kits and off we go. Imagine my horror then, to spend 20 seconds staring at the samples laid before me to realise that they did not match the kits I'd been up since 5am preparing! Argh and ahmaagard! Yep, I'd kitted the wrong workshop. I kept my manners and did not swear out loud. It took less than five minutes to ascertain the level of interest in the workshop I had prepared. So I went home and re-kitted, at speed. The girls were marvellously forgiving and managed to complete the workshop by one o'clock, despite the hour-and-a-bit late start, and what's more, they seemed to enjoy it. The evening version went much more smoothly and started on time. Funny, that. It'll be a while before I get over it though, I must say . Colour me a professional! I'm sharing this on Annie's Friday smile...because it's nothing if not ridiculous! Have a lovely weekend. The photo is late dusk, Tuesday evening. This is because Mr Dunnit has just announced a change of plan for tomorrow. Which won't involve my having to be up for six something, so unlike last week, I shan't be posting live! There's not a lot to report..the lack of iPad on stand is a good indication of the lack of time I've managed at the old desk so far this week! But I think I have finished the party invitations and that's a bit of a relief actually. The lovely 'One Day This Desk Will Be Tidy' mug is looking a bit empty. Because the pens it should be holding are strewn all over the desk! Ah, the irony. The notepad under the invitations is my work 'day book' and is probably the best tool I own in truth. Every day I write the date at the top of a clean page and it becomes a phone log, notebook, list maker place. I draw lines between things and can cross 'em out when done whilst retaining a record. Important when your memory fails as often as mine. I'm never going to get used to using the computer for such things. I dread to think how I'd get on in a real office! 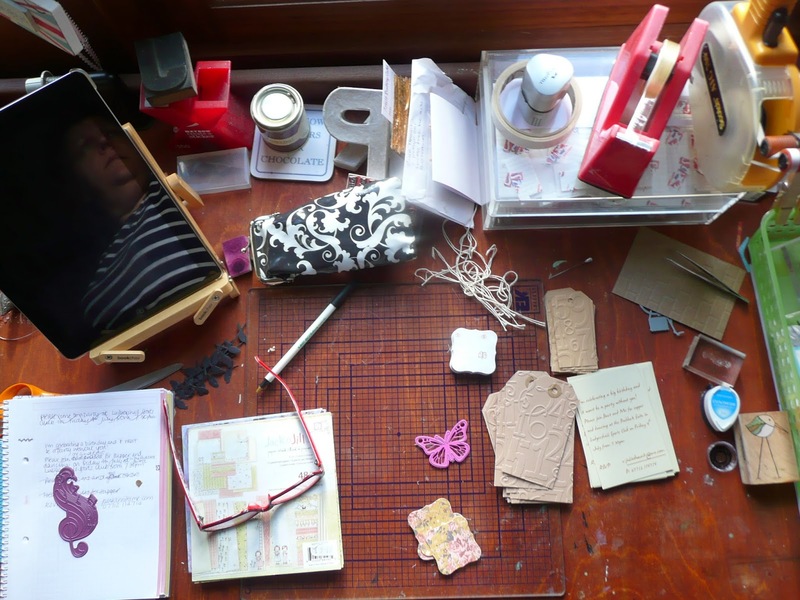 So..you know the job at hand - upload a photo of your workspace to your blog, put WOYWW in the post title, link here and join the visiting. I promise and guarantee greater inspiration and more interest at every other desk than this! 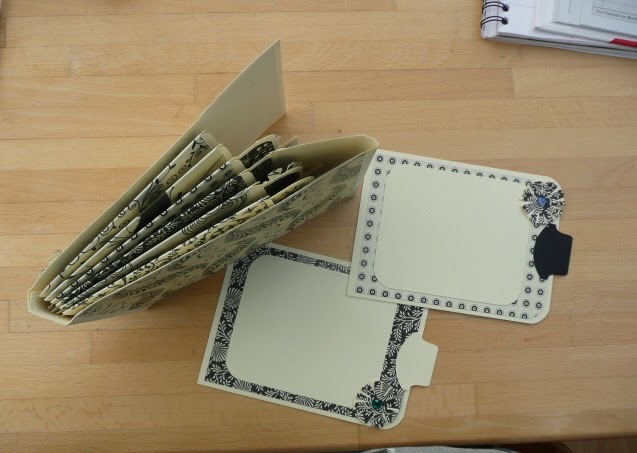 I casually mentioned to Annette that the beautiful tag book that she'd made would be a great thing to replicate and use to store ATCs from our upcoming fifth anniversary. And of course, filed another note on the mental 'to do' list. Completely out of the blue, Gordon the Post has delivered the very tag book to me all the way from Australia. I'm thrilled skinny. Well slim. Skinny isn't going to happen. 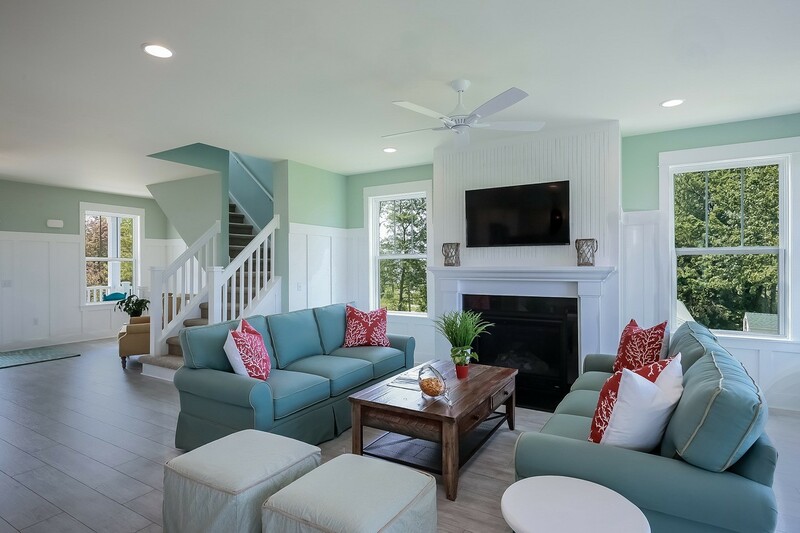 beautiful papers, fabulous finishes, isn't it lovely? And a post-it holder and ATC for the Anniversary.. Thank you Annette. I really like it and really appreciate your generosity. Please bear in mind that whilst finding time to make this, let alone run out and invest in posting it, Miss Annette has just unpacked from movinghouse and is now, suddenly, re-packing to move across the world. So how come I don't have those pressures and as yet haven't managed so much as five minutes at my desk since last Thursday. Time management. If I had time, I'd learn it. 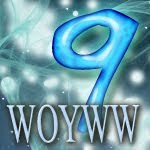 I know that a lot of you know, but I'm going to answer a few questions about the WOYWW Crop and the ATCs for our WOYWW Anniversary exchange. Not a complete decoy photo. My mini craft tote, made by LLJ. She will be offering a selection of these for sale at the Crop. Profits to our chosen charity. 1. How many do I make? 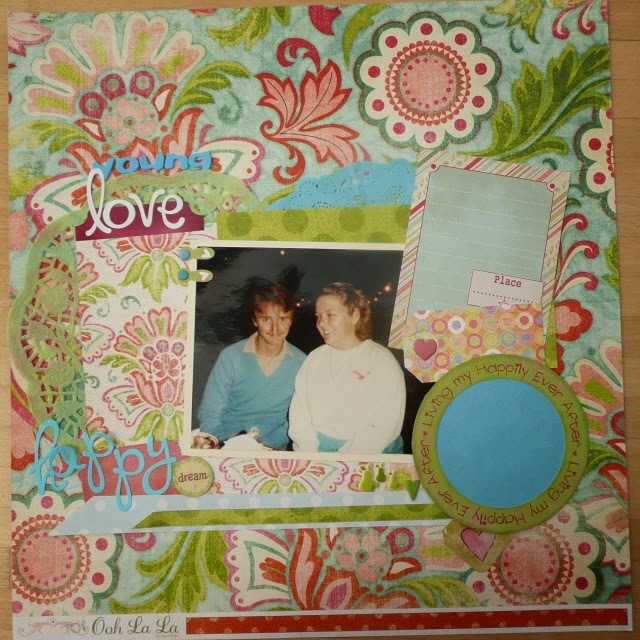 To take part in the anniversary swap on week 260, you need to make ONE. Instructions for that swap process can be found on this page. 2. What if I make more? Make as many as you'd like to, you can 'advertise' them for swapping with more WOYWWers or contact people privately, whatever you wish. 3. What's all this about ATCs and the Crop? I suggested that if you're coming to the Crop and would like to, it's a great opportunity to swap or present ATCs to some fellow Deskers. You don't have to, we aren't specifically having a swap meet! I also suggested to those of you that can't come to the Crop that if you wanted to present ATCs to some/any of the Deskers that are coming, you could send them all to me and I'll distribute them. It may save postage. This doesn't mean you have to make one for everyone who is coming to the Crop, nor does it mean that people who don't get one will be offended. That's not at all what it's about. 1. On Saturday May 24th. Soon. It's at Burbage Village Hall..SN8 3AJ, starting at 10am. It's a closed event, so we need to know in advance if you're coming. 2. We reckon that subs will be about £10; this includes hall hire and food and drink. Drivers/partners who are dropping you off are welcome to come back for lunch, but there is a need to pre-book and the charge will be a £5. 3. We will be offering some goodies for raffle, 100% of funds raised will be donated to our chosen charity - The Alzheimer's Society. 4. There will be a 'for sale' table too - anything you'd like to bring for sale - do! Old stash, hand made crafts....try it! One of the raffle prizes. 5. Lunch Lady Jan will need catering figures by Monday 19th May, so if you're an undecided about coming..there's your deadline! Ask anything - nothing is a silly question, and someone will always come up with something that I've forgotten to mention! Really. 257. So that's only 3 weeks from the big 5th anniversary on 260. How ridiculous. How hilarious! If you're tempted or planning to come to the WOYWW Crop (and why wouldn't you be - it's a gas! 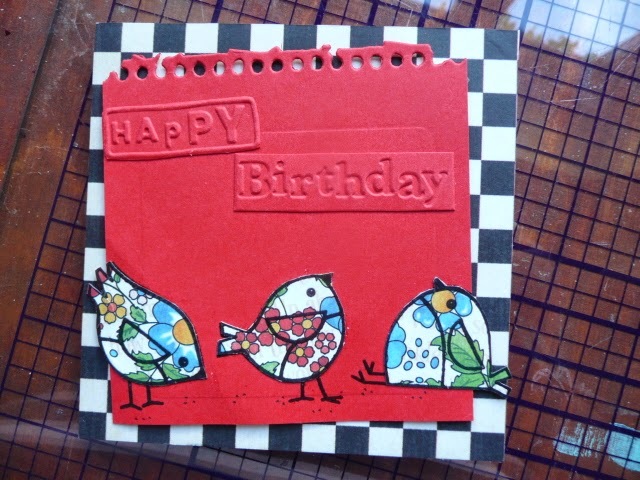 ), please leave a message to say so - unless you have already of course - there's a page at the top of this blog about the Crop, and about the Anniversary ATC RAK...click to explore. Thank you! In the meantime, there's yet more multiples type work at my desk. I'm making invitations. And I'm not really sure how or what look; I'm genuinely going with the flow. And trying to use nothing but existing stash. Hmmm, I will report in, if they end up looking anything like the elements that are gathered thus far it will be a miracle. Things are relatively tidy. It's really rather calming. Considering that calm is not at all how I'm feeling about getting these done. Nothing like a deadline, huh! See that treble clef die at left on my notebook. Bought especially for the invites. Unused so far. More Hmmmmmm. Now please, share and tell will ya, it's all about seeing the surface and drooling over what you've got and what you're doing. I know the arrival of light mornings in the UK has meant that I am now posting after 6am BST, but really, you abroad types get the scheduled version all winter! Join in then - put WOYWW in your post title, link here and put the kettle on. Thanks! Lisa-Jane is a WOYWW Desker, and a member of I don't know how many design teams. 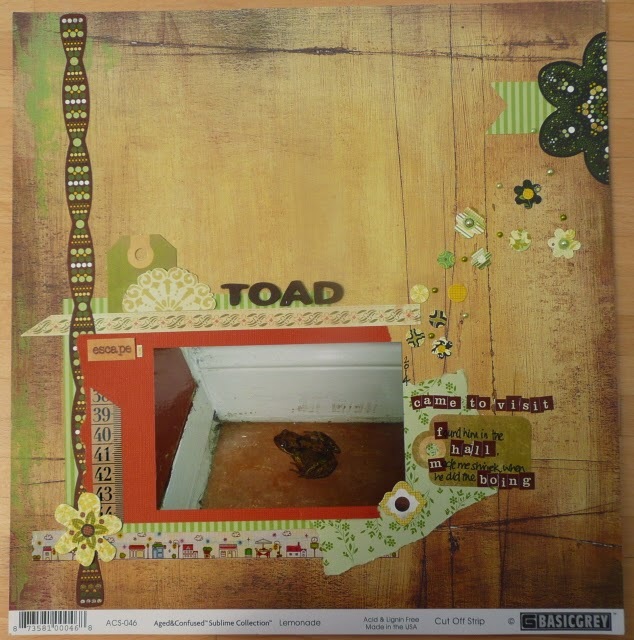 Scrapbooker extra-ordinaire, lemme tell ya. well, she posted up May's chalelnge for SJ Crafts and because Saturday was National Scrap Booking Day, I thought I might have a crack at it. OK. I admit, it was more because it looked like a challenge I might actually be able to do without it looking totally contrived. 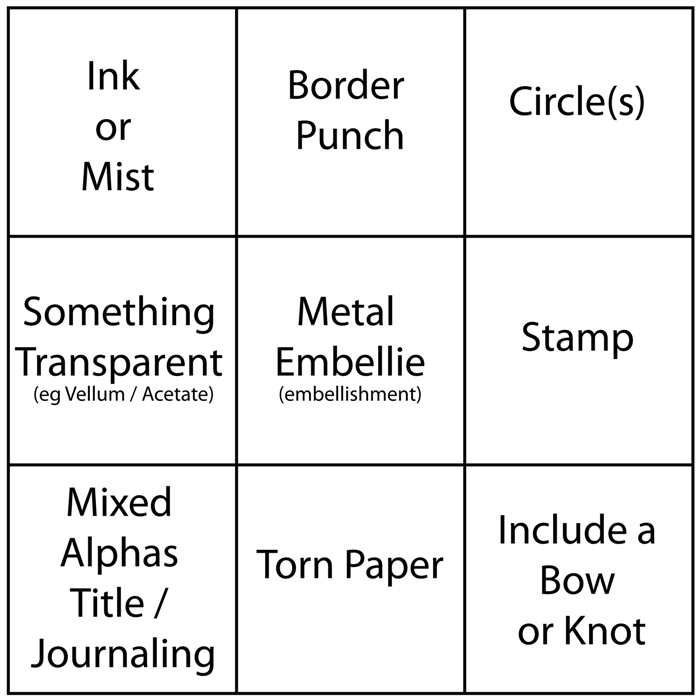 So the challenge was this Bingo grid...include three of the features but be sure to include the middle square, so work horizontally, diagonally, vertically, blah. You get it. Sooner than I did, I've no doubt. Well, continuing with the crusade to scrap old photos as the mood takes me, I give you me and Mr Dunnit when I was 19. We were on holiday in Argeles Sur Mer, south of France and rather bizarrely, I am wearing my old school sweatshirt. I have to say that when I look at this, I just see fresh skinned youth. But I'm hoping you'll see the metal embellies, the mixed font alphas and the circles. You can already see it's My Mind's Eye papers and more doilies...but in my defence, they're circular! And I haven't done the journalling yet...that's because I was hoping to get some comment from Mr D first..you never know, he might have something more interesting to add than 'oh look at how young we were'. Coming home from a crop with a finished LO except for the journalling is definitely a sign of my maturity (as a scrapbooker you understand) - in previous years I've just gone ahead and done it, just to call the page finished. See, I'm evolving! It makes everything burst into green, buds swell and produce blossom the like of which makes me swoon. The grass grows and smells sweet after cutting. The morning birdsong drives me crackers because it starts so early and they stop welcoming the dawn when I have to get up. The weather becomes even more of a national obsession - will we have a good summer? I don't know. I'd quite like two consistently dry days so that I can start tidying up the garden. That's driving me crackers too. So yesterday was beautiful. There was every opportunity to mow and clip and compost. But there wasn't really. Yesterday was Crop. And National Scrapbook Day to boot, so it would have been doubly rude to blow off the date for the sake of some lawn maintenance, non? Mais Oui. So I didn't. You can see the not-filled-in date pennant. I can't remember how old she was in this sweet pic. May Day was her 19th birthday see, so I'm still a bit behind. I have to scrap photos as I feel like it; chronological scrapping is mind numbingly boring for me. I know it says something about me, but I'm not sure what. And slightly more up to date, we had a visitor last month after we'd had the conservatory door open for an evening. Luckily, Mr D and Miss D were delighted by him and captured and re-homed him with care and much mirth at my ridiculous girly shrieking. Honestly, the unpredictable 'boing' motion made me flee. Wow, never knew I could be shaken by a tiny toad! 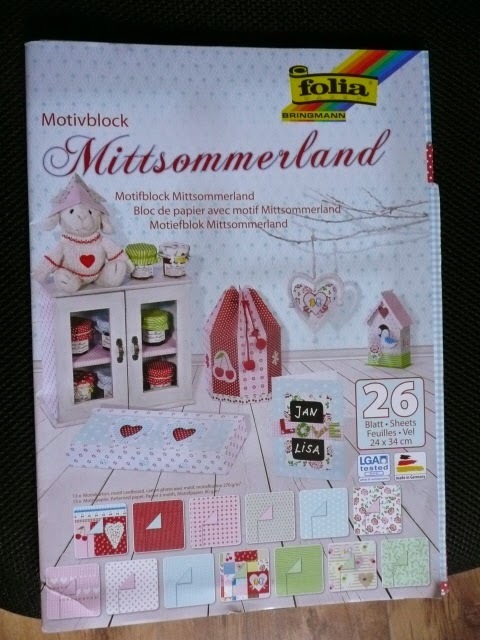 I'm being quite doily and printed paper free, as you can and will see over the next few scrapbook related posts..I was sent some lovely stuff to play with by the good crafty people at Baker Ross and I'm really enjoying them. 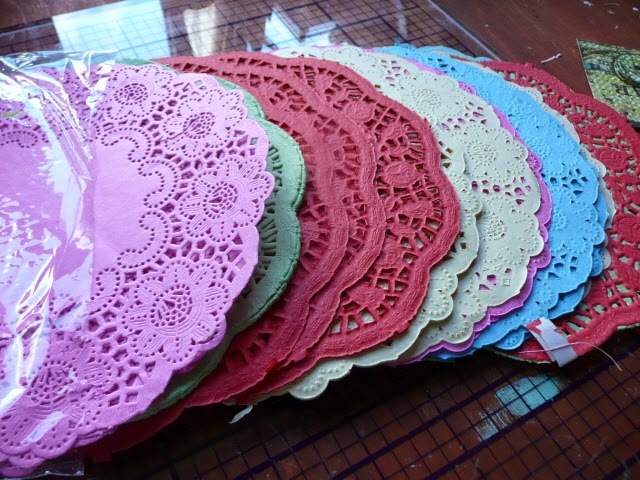 An apparently inexhaustible supply of doilies, fab colours! And a pad of summery printed papers, 24 x 35cm, so perfect for preventing the need to cut into another 12 x 12 when looking for a piece of background or matting. Happy scrapper! Now, today is the second consecutive dry day, so after this, I'm off to Lawn Mower land. Wish me luck. it's a jungle out there, well at the uncut-from-last-time edges, anyway!